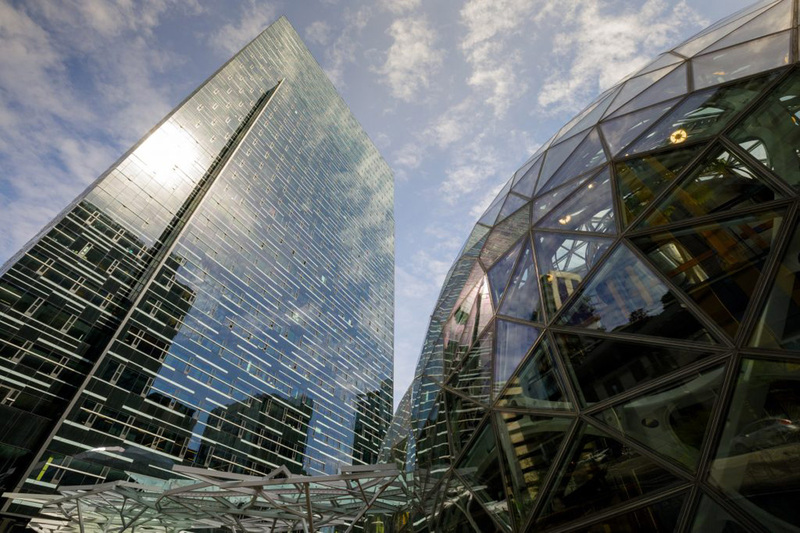 The new Amazon Spheres in downtown Seattle are a verdant wonderland, a stunning architectural masterpiece comprised of glass and steel. Tucked comfortably between the high-rise structures in Seattle’s bustling downtown, the trio of glass domes has been the talk of the town over the past decade. 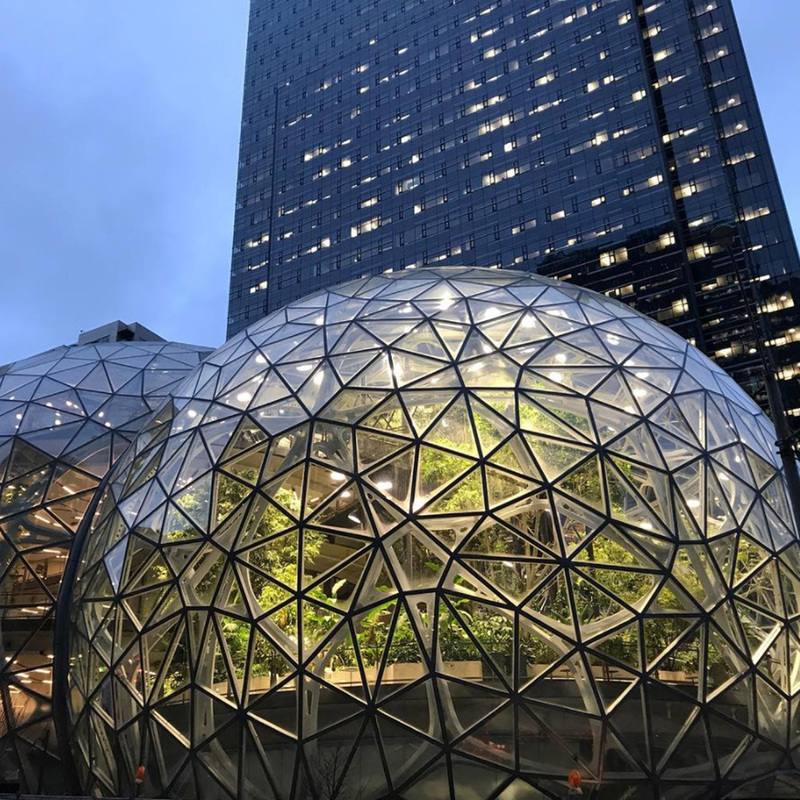 In January 2018, Amazon officially opened the Spheres, after spending the past year filling the domes with plant life. 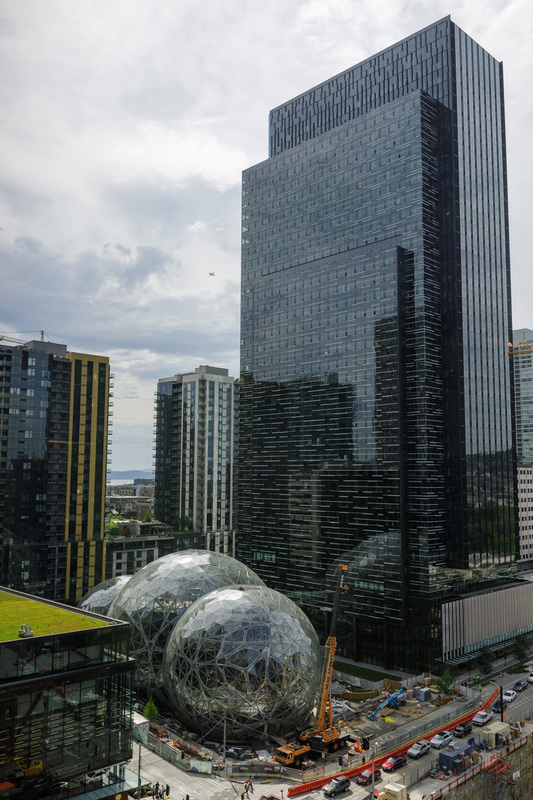 The spectacular structure is the product of architecture firm NBBJ, who designed a large majority of Amazon’s expanded campus downtown and Seattle’s Denny Triangle neighborhood. The whole idea behind the Spheres’ design was to create an office space that was connected to the natural world through biophilic design. 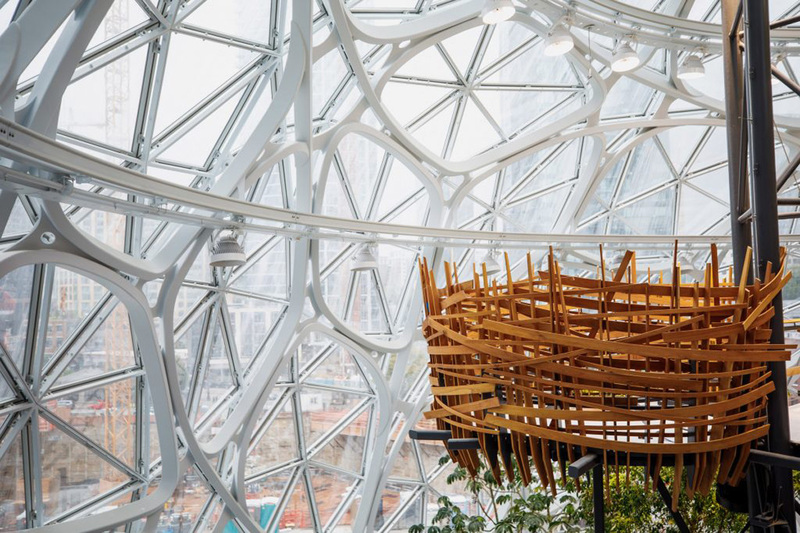 In addition to an abundance of plants, the Amazon Spheres feature meeting spaces and a few grab-and-go restaurants. High up in the domes, a canopy walk grants people incredible views of Rubi, a 55-foot-tall, 48-year-old Fiscus rubiginosa, the tallest plant in the area. In fact, the biggest challenge encountered was transporting Rubi from a southern California farm to downtown Seattle, where Rubi was lifted by a crane and lowered through a hole in the roof. The interior of the Spheres is very much like a tropical rainforest, where temperatures can rise to approximately 72 degrees Fahrenheit with 60% humidity. At night, the temperature drops to 55 degrees with 85% humidity. The fluctuation between temperatures paired with the ever-present humidity creates copious condensation. To combat corrosion caused by the exposure to the elements, the Spheres’ structural steel frames were coated with Tnemec’s Fluoronar, a FEVE-based fluoropolymer. The Lumiflon FEVE resin technology employed by Fluoronar protects architectural surfaces from elemental deterrents that would otherwise result in coating degradation. Lumiflon FEVE resin provides a plethora of benefits for coating systems. Advantages range from hyper durability and weatherability to unparalleled color and gloss resistance, all of which guarantee the structural integrity of coatings for decades.